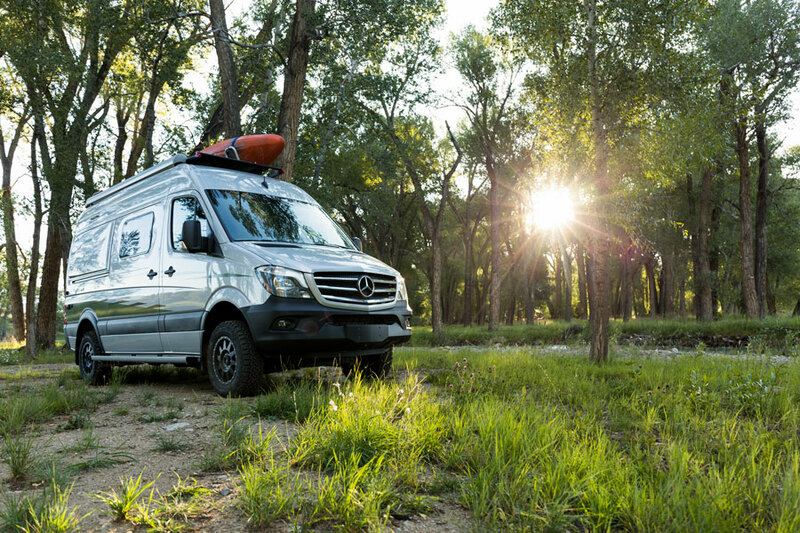 5 Reasons Why the Winnebago Revel is a Great RV! 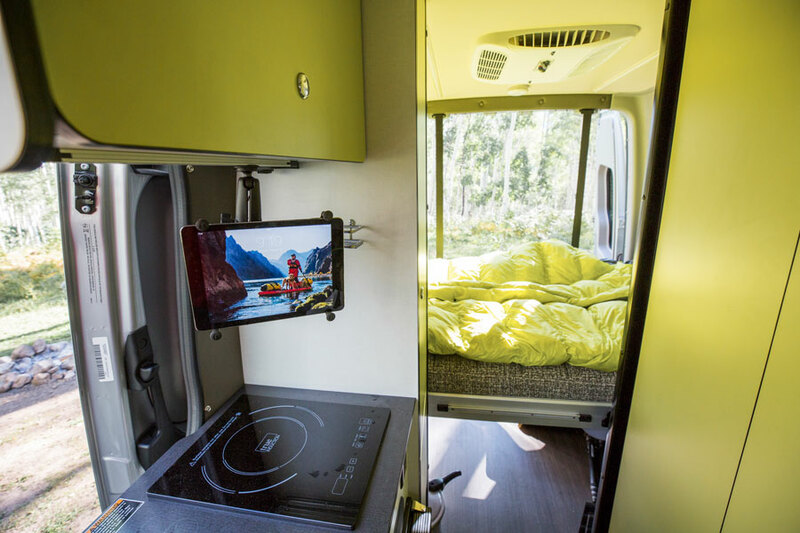 The Winnebago Revel opened up a new world of RVing possibilities with its launch in October 2017. 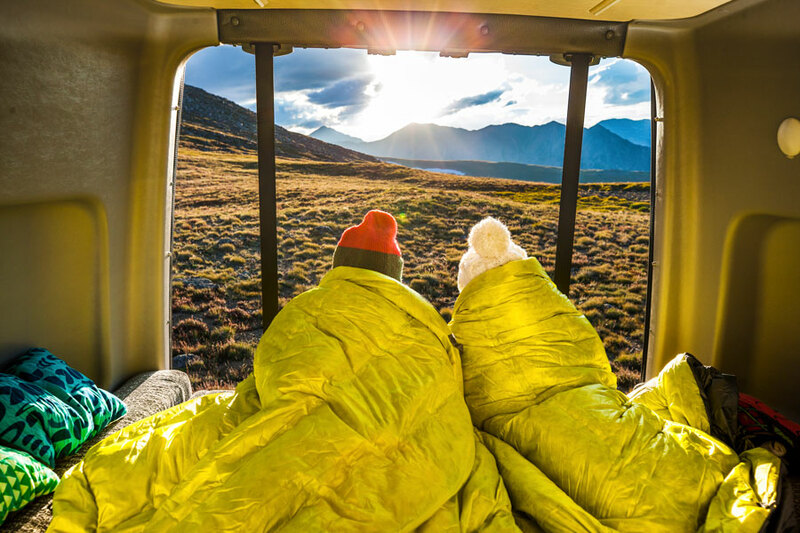 The Revel is the first of its kind, a true 4×4 RV designed for outdoor enthusiasts taking a no-nonsense approach to adventure with straightforward design and function-forward features. There are several reasons why the Winnebago Revel is a great RV, read our top five below. True, Off-Road RV – If you are looking for a vehicle that can take you off the beaten path and away from the traditional campground the Revel is the perfect vehicle for you! The Revel is built on the 4×4 Mercedes-Benz with a 3.0L V6 turbo-charged diesel engine, with adaptive ESP. The adaptive ESP selectively brakes individual wheels, providing increased traction, enhanced directional stability, and road adhesion in rougher terrain. The optional stylized wheels and BFGoodrich T/A K02 all-terrain tires have tougher sidewalls, a long treadlife and aggressive all-terrain traction providing a solid grip for traveling off-the-beaten path. Room to Bring all your Gear – The Revel was designed for the outdoor enthusiast who have several hobbies that require a lot of flexible storage solutions. The power lift bed with gear garage is a key storage spot in the Revel, providing 140 cu. ft. of storage space. The all-in-one gear closet and wet bath provides a spot for wet storage and includes three bamboo removable shelves, a removable clothes rod, and a bamboo shower mat. 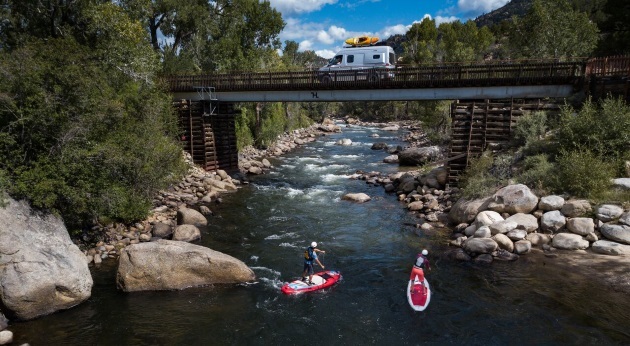 Four-Season Capabilities – The Revel is Winnebago’s first truly four-season capable RV. 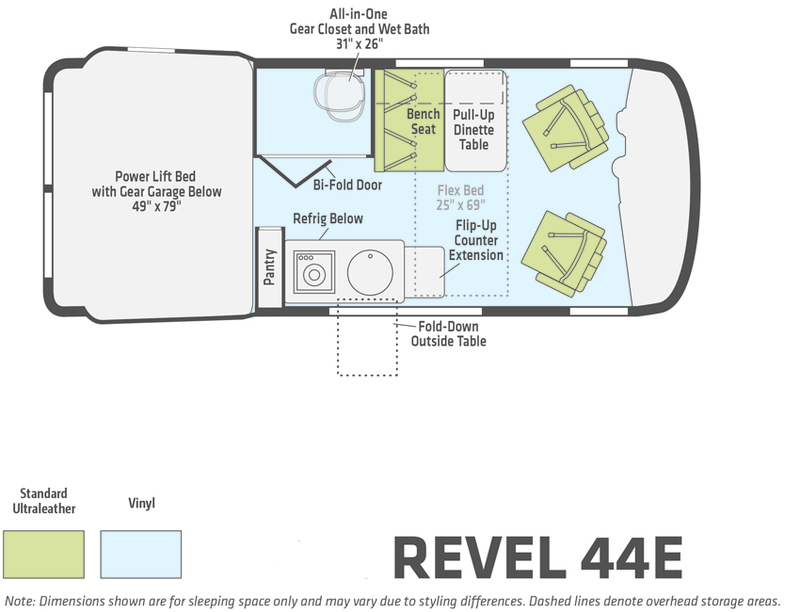 The Revel includes several features that enable RVs to enjoy extended season camping. The first, is the Revel’s additional insulation. 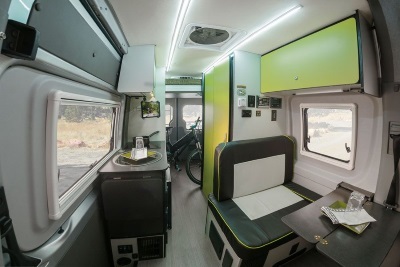 Winnebago Industries has partnered up with the same component manufacturers that General Motors, Mercedes-Benz and The Ford Motor Company has used, using Automotive Grade Foam Insulation. This insulation has an R-rating of 4.4 per sq. inch so it won’t settle as you are going off-road or off the grid. It also does not maintain odor and is built to provide the same R-value for the lifetime of the vehicle. This insulation meets automotive fire and safety standards. The insulation is engineered for noise reduction and thermal insulation and is not susceptible to moisture retention or mold. The second is the Espar diesel-fired hydronic heating system that provides continuous, unlimited hot water that will heat the coach, and the holding tanks to keep them from freezing. RV Off-the-Grid – If you are looking for a coach that will allow you to RV off-the-grid and away from the traditional campground the Revel is the perfect coach for you! The Revel comes with 3 deep-cycle AGM group 31 batteries that are rated for 315 amp hours of power. The Revel also comes standard with 200-watts of solar and a 2 kilowatt pure sine wave inverter to safely power your electronics. One of the most unique features in the Winnebago Revel is the diesel-fired hydronic heating system that we previously mentioned. This system enables the Revel to be powered by a single fuel source – diesel fuel. Winnebago’s Superior Experience Manufacturing RVs – Winnebago has been building RVs for over 60 years and can manufacture better-fitting, molded parts that DIYers or one-off chassis upfitters are not able to. The Revel is also supported by Winnebago’s dealer network which allows customers to qualify for long-term, low-interest financing through a RV loan. It is more difficult and often more expensive to secure financing to purchase a van from a DIYer or van body upfitter rather than an RV dealer. 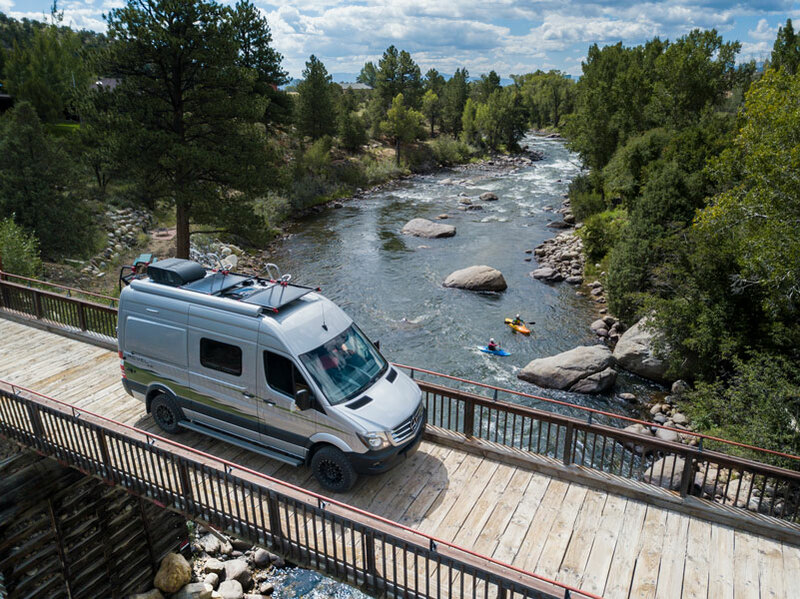 Those are our five reasons why the Winnebago Revel is a great RV. 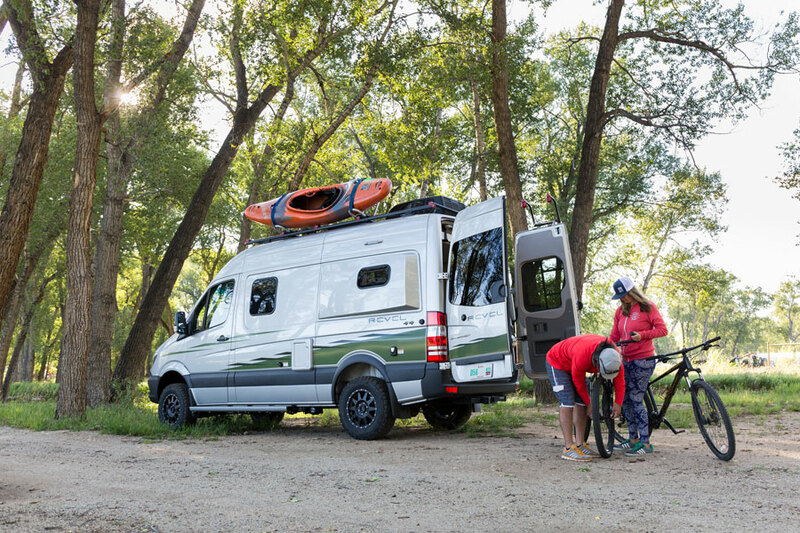 Click here to see our Revel Revealed page for videos, blog posts, gear, and more specifically for the Winnebago Revel. 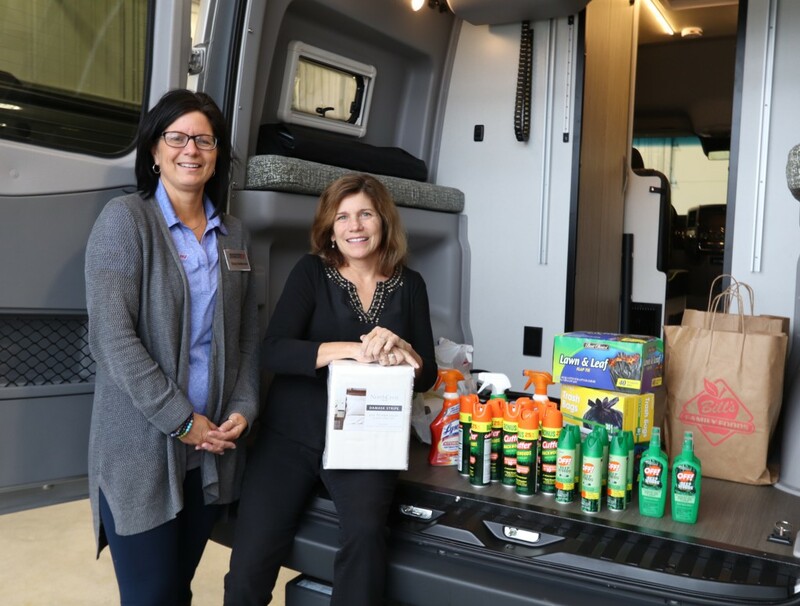 New Winnebago Revel owner, Gayle W. is headed to the Carolinas to assist with the Hurricane Florence relief effort. 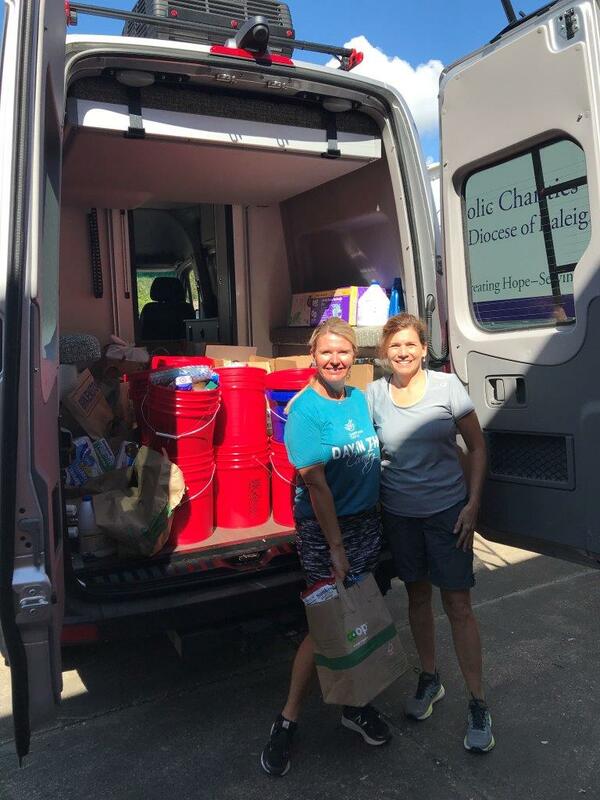 To support Gayle’s efforts the team at Lichtsinn RV brought in supplies to send with her to provide aid to the citizens of North and South Carolina. We were happy to support Gayle and assist in the hurricane aid efforts in any way we could. Lichtsinn RV Sales Consultant Stacy Anderson with Gayle on her way to the Carolinas. “The Revel performed beautifully on the ride to North Carolina. 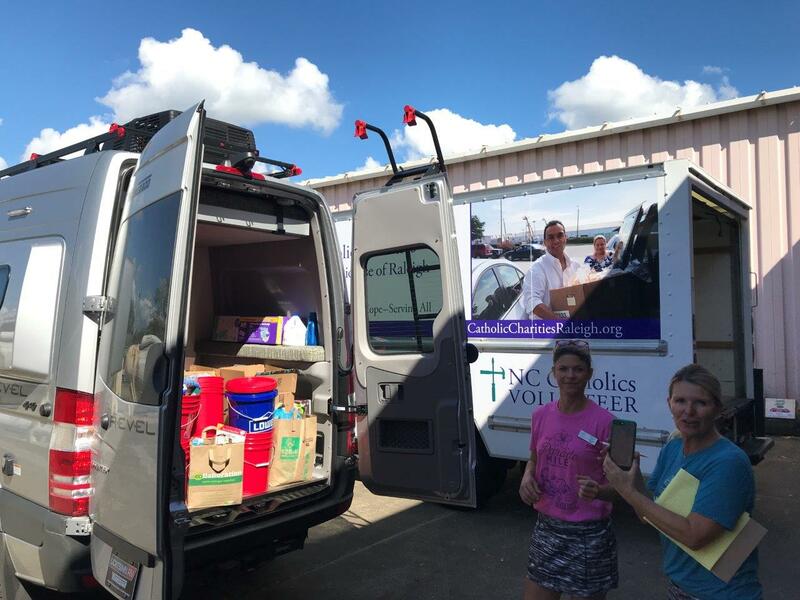 On Monday, I was able to take your donations along with other donations from a church in my hometown. 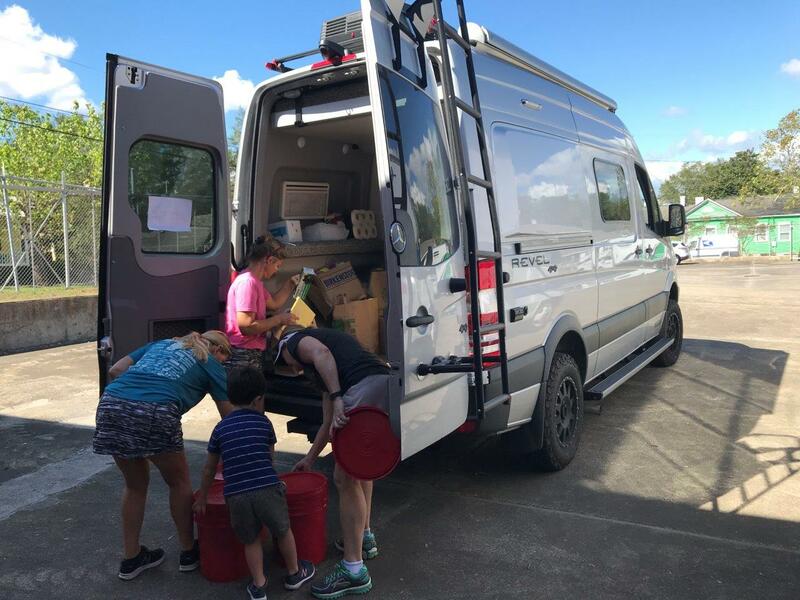 The donations went to a drop-off center in Wilmington, NC. Apparently, they have not had mosquito spray donated and they were thrilled to see all of your cans. I witnessed first hand how bad the mosquitoes are down there. Public green spaces like national parks and hiking trails offer us an affordable and easy escape from our daily routines. 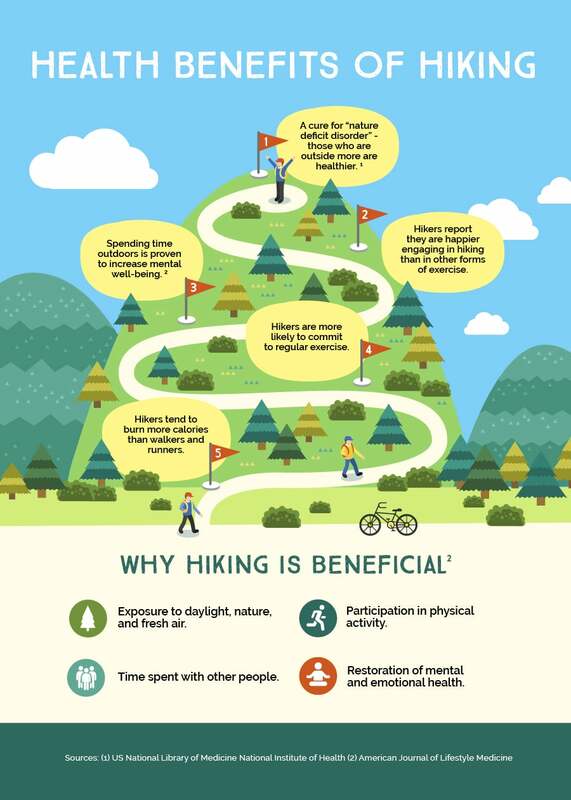 The combination of hiking and physical exercise outside has been proven to lead to increased physical, emotional, and behavioral well-being. The presence and use of national parks is especially important in American culture because we have adopted a sedentary lifestyle. In fact, a study notes that 43% of the U.S. population is sedentary the majority of their lifetime.​ This percentage is by far the largest amount of inactivity in comparison to any other country worldwide. Nature-deficit disorder simply means that people are not outside enough. A study by the US National Library of Medicine National Institute of Health links sedentary behaviors and nature-deficit disorder to health issues like obesity, cardiovascular disease, hypertension, type 2 diabetes, anxiety, depression, mental fatigue, and increasing stress levels.​ People who spend less than the recommended amount of time outside are more vulnerable to health issues like morbidity and premature death. Even though nature-deficit disorder is a fairly new term, we have known about the importance of being outside for centuries. Dating back to the 19th century, parks were created to provide space for recreational activities when scientists and architects came to understand the connection between green space and health. Even so, we continue to build gyms indoors and promote 40 hour work weeks that require us to sit inside on a computer for a large chunk of our day. So now the question is, how can we combat these health issues and the American sedentary lifestyle? We suggest hiking or biking. Based on the statistics, you’re most likely lacking time spent outdoors so we’re writing you a prescription for hiking. Even though there are trails all over the United States, some of the most beautiful and exotic hiking trails run up and down the east coast. Cure nature-deficit disorder for good with some of the most beautiful views along the east coast that we will outline for you in this article. So without further ado, here is a list of unique hiking experiences that will lift your mood and have you feeling better than ever before. Trails included: Crest Trails are called Grandfather Trail and Underwood Trail. 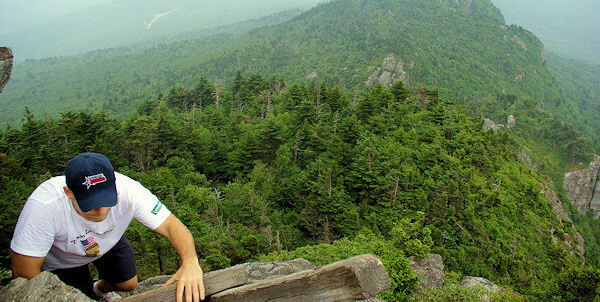 Park Size: Grandfather Mountain State Park has 12 miles of trails across 2,456 acres along mountain ridgeline. Cost: Access the Crest Trails for free from trailheads outside the state park attraction area. If you want to visit the swinging bridge, a pass is required which costs $20 per person. Regulations: Must return to vehicle by 6pm or other specified time which can be found at the visitor center. Parking: There is a parking lot with facilities in the visitor center. Access: Crest trail access is at the Top Shop parking lot, Hiker’s Parking Area, on through the Profile Trail or Daniel Boone Scout Trail. Duration of Hike: up to 2.5 hours one-way. Pets: This trail is not pet friendly unless you have a little pup that you can fit in your backpack. Who: Not recommended for pets, children, or inexperienced hikers. What you’ll need: Water, snacks, proper hiking boots with good tread, and rain gear just in case. What to expect: Cables, ladders, rocky terrain, steep ledges. Regulations: Hikers are required to fill out a piece of paper with their name and vehicle descriptors. The park calls this a “permit” which is meant for safety purposes if you do not return to your vehicle by the designated time and is free. 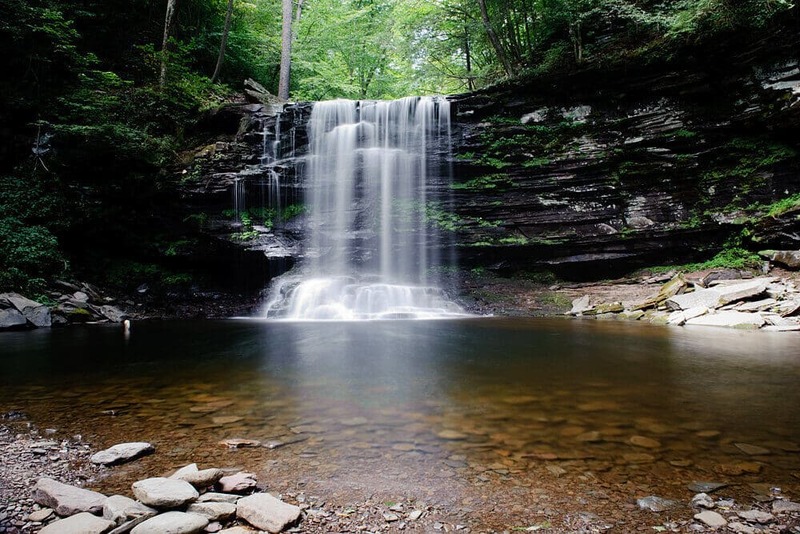 Park Size: Ricketts Glen State Park contains 13.050 acres of land. The full loop is 7.2 miles if you hike the upper and lower portions. Take the 3.2 mile loop on Highland Trail, Glen Leigh and Ganoga Glen sides of the trail to see most of the waterfalls. Pets: Dogs are welcome but must be on a leash at all times. What you’ll need: Sturdy hiking boots or sneakers, and water and snacks. Lake Rose is at the end of the dirt road across from the campground and provides the closest access (5-10 minutes), but fills up quickly during peak times. Beach Parking Lot #2 is at the beach. Leave the lot and walk down the Cabin Road (first road just outside of the lot), past a park gate, and onto a section of trail to the first intersection where you go right (15-20 minute access). Park Size: Baxter State Park is made up of 200,000 acres. Knife’s Edge Trail is 1.1 mile rock scramble and is notorious for only being a few feet wide in some areas. Cost: Register at one of the two gatehouses coming in. There will be an entrance fee if you do not have Maine plates on your vehicle. Be prepared for heights, sheer cliffs that plummet 1,500 feet from either side of the trail into the Great Basin floor. If you are day-hiking you may want to save your parking spot with a reservation. Access can be found at the Roaring Brook Campground which is an hour from your vehicle on the opposite side of the mountain. There is no shuttle service. 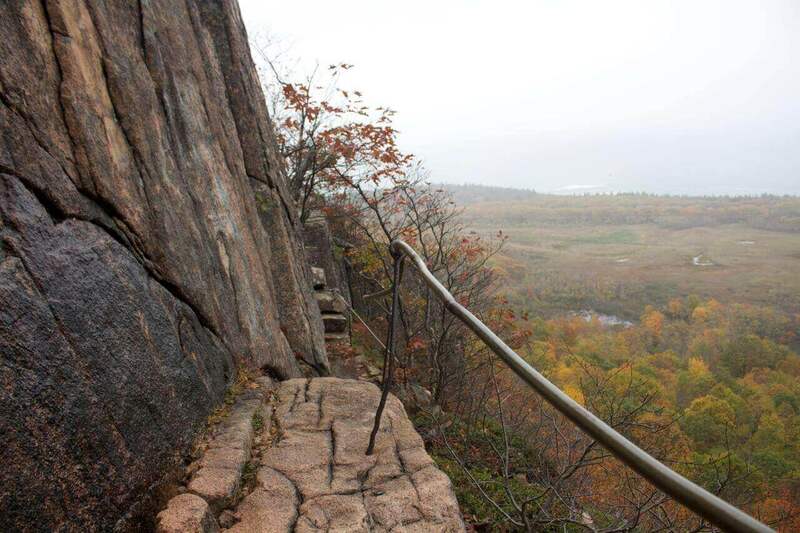 You will end your hike at Roaring Brook Campground if you hike the Knife’s Edge from the Hunt or Abol Trails. Park Size: Acadia National Park is 49, 052 acres. The trail can be closed late spring through mid-August because endangered peregrine falcons return to the area during that time. Champlain Mountain sites on the easter edge of the park. Use Highway 3 to go south and then look for the intersection with the one way Park Loop Road which will take you to the trailheads. 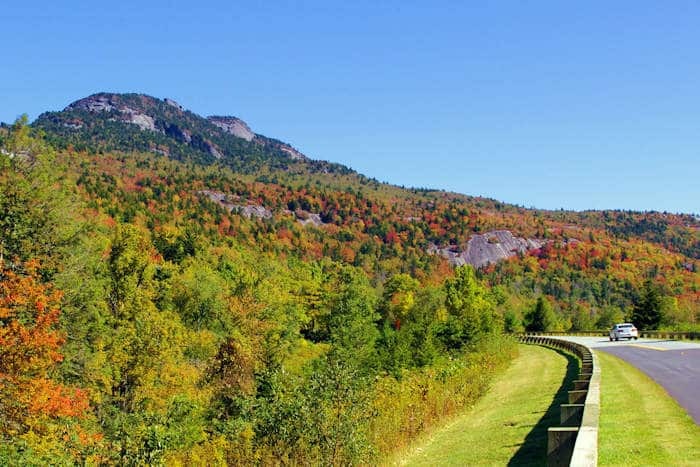 Park Size: Franconia Notch State Park is 6,692 acres. This park is also the home of the famous Old Man of the Mountain or the “Great Stone Face”. and 5 & under is free. 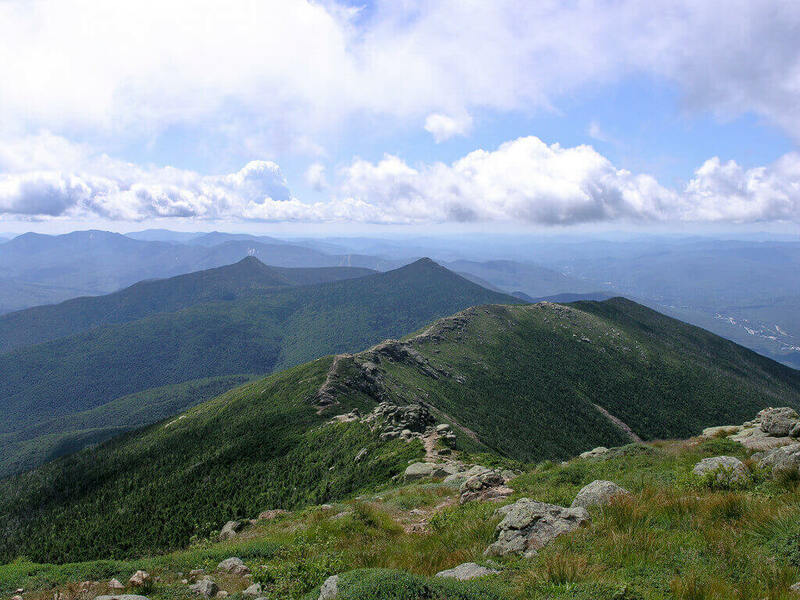 According to REI’s Hiking Project, you will encounter the second highest range of peaks in the White Mountains and multiple waterfalls. What is a four-thousand footer? A group of 48 mountains in New Hampshire at least 4k feet above sea level. 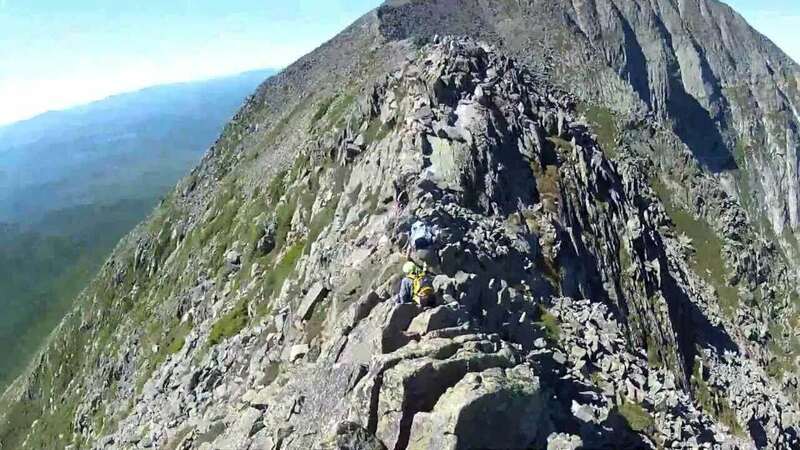 After hiking the Francis Ridge Loop you’ll be able to say you’ve hiked a few of New Hampshire’s 4,000 -foot peaks in one day. 360 degree views of the entire Pemigewasset Wilderness, views of Vermont and even New York State weather-permitting. Main parking areas including Flume Gorge, Lafayette Place CG, Aerial Tramway, and Echo Lake Beach are for paying guests only. Use the Trailhead Parking/Lafayette Place Campground to access the trail. Falling Waters is a 3.2 mile direct route to the Franconia Ridge Trail. Experts agree that inactive adults partake in less than 150 minutes of walking or moderately intense physical activity each week and children engage in less than 60 minutes of strenuous physical exercise each day.​ Sedentary, indoor lifestyles and minimal exercise are quite common in the United States in both adults and children. Studies show that this new and consistent lifestyle results in health issues that are potentially lethal. Now that you are aware that a lack of outdoor exposure and increasing sedentary lifestyles are dangerous for your well-being, start making time for self-care. 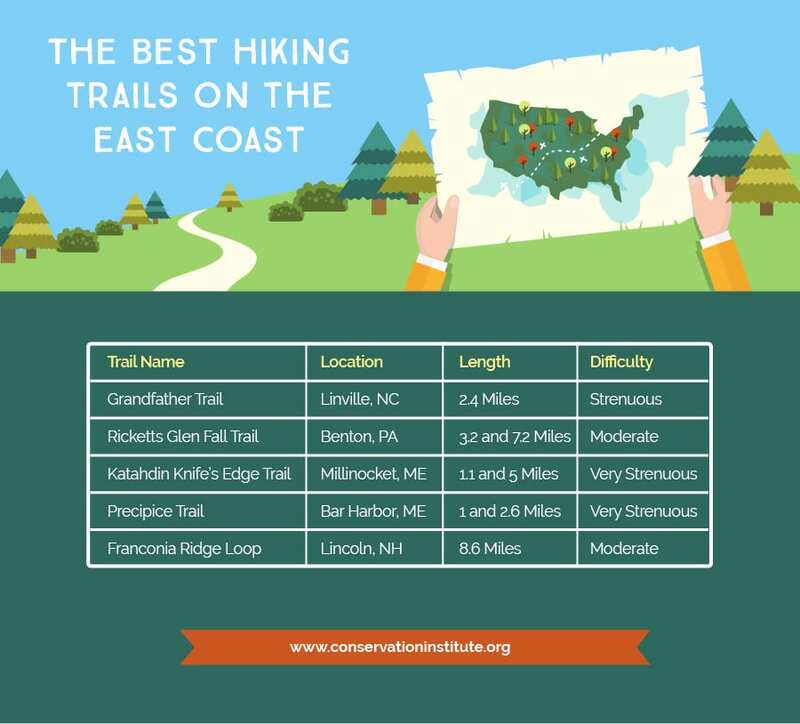 Plan a weekend or day-trip to one of these unique hiking trails along the East Coast to increase your well-being and quality of life today. Your prescription for hiking will always have unlimited refills. So you just purchased a Winnebago Revel, you may be asking what parts and accessories do I need for it. We asked our RV parts team to identify the most popular parts and accessories Revel owners purchase. Check them out below. Ram Mounts RAM X-Grip for cell phone or tablet – is appropriate for a wide variety of applications including driving, boating, cycling and performing. The spring loaded RAM X-Grip features expandable grip arms for quick insertion and release of your phone or tablet. For more intense environments, RAM X-Grip comes with a rubber tether that easily holds your device in place for added piece of mind. Features a high strength composite and stainless-steel construction, spring loaded holder that expands and contracts for perfect fit of your device, rubber coated tips will hold device firm and stable, holder allows for attachment to many RAM ball mounts, and lifetime warranty. Aluminess Front Bumper – The Mercedes Sprinter vans are great vehicles for traveling. They have a ton of room and can be converted to motorhomes or mobile garages. The big drawback is their fragile front end. With the Aluminess front bumper, Sprinters finally have the protection they need from wildlife. They are even winch compatible for those sticky situations that you might find yourself in. They weigh only 85 pounds and are designed to fit the sleek lines that the Sprinter van is known for. Aluminess Rail Kits, Box Shelves, and Storage Boxes – If you have a lot to carry or bulky items, then the deluxe box is for you. It is 30″ tall x 16″ deep x 24″ wide and is watertight. Many people will install a shelf (sold separately) to help organize storage. The drop down door is perfect for outdoor kitchens or to use as a work surface. Culligan RV and Marine Drinking Water Filter – The Culligan RV water filters reduce sediment, chlorine, taste, and odor in the water supply to campers, trailers, motor homes, and boats. Culligan RV filters produce healthier, better tasting water for drinking and cooking while on the road. Filtering dirt and sediment is essential to keeping your RV storage tank clean and clear. Zero-G RV and Marine Hose – Research with hose purchasers overwhelmingly indicates a preference for hoses which offer light weight, easy handling, kink resistance and lasting performance. The zero-G™ advanced hose design takes these must-haves to a higher level than ever before. Compared to traditional heavy and professional water hoses the Zero-G RV and Marine Hose is up to 40% lighter weight than heavy duty vinyl hoses, has kink-free uninterrupted flow, is easy to store – small and compact, has tough G-Force™ woven fiber jacket resists leaks, abrasion and punctures, has a 600+ psi burst rated, provides consistent, high flow equal to a conventional 5/8” hose, flexible and easy to maneuver even in cold weather down to 35°F, and provides lead free, safe drinking water. RV Surge and Electrical Protection – Electrical Management System (EMS) helps to protect your RV against voltage fluctuations, power surges and incorrectly wired shore power which can cause severe and costly damage to RV appliances and electronics. Improved design features include: state-of-the-art microprocessors, all weather shield assembly, rugged pull handle, secure locking bracket, built-in scrolling digital display and a tough Lexan® housing. Sleek, compact portable design makes unit easy to use and store. Plug-and-play application. WeatherTech Bump Steps – BumpStep is a trailer hitch mounted bumper protector that defends your bumper against rear end accidents, dents and scratches. Given its 12″ width, BumpStep can also be used as a step to reach the top roof of your vehicle. Highland Retractable 6’ Ratchet Tie Downs – Highland Standard duty Retractable Ratchet Tie Down has coated S-Hooks to prevent marring and scratching. It measures 6’ long by 1” wide and has a load capacity of 400 lbs. Designed to rewind with just a push of a button for easy storage and no tangling, this strap makes it the perfect fit for keeping cargo in check with its 1200-pound break strength capacity. The quick and easy to use ratchet allows you to control the tension on the strap for a snug fit to your cargo or tarp. Highland is dedicated to helping you safely load, anchor, secure, carry, trailer and organize cargo. From aluminum ramps to fat strap bungees and cargo securing products, Highland products are manufactured to quality standards designed to meet, and exceed, every expectation. Order your parts online here or call us at 1-800-343-6255 or email us at parts@lichtsinn.com for assistance! The Winnebago Revel has several convertible features, in this video we go over four of the convertible features in the all-new Winnebago Revel. 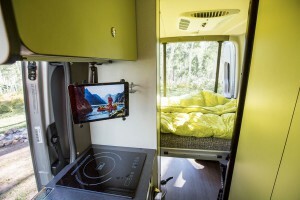 Not only does the Winnebago Revel have an expansive Power Lift Bed in the rear of the 4×4 RV, it also can convert the front Bench Seat/Dinette Table into a sleeping surface as well. The Winnebago Flex Bed System makes this possible. The resulting sleeping surface is 71″ in length and is 25″ wide at its widest point. The exterior table is stored in a secure upright position while traveling. To release the table, you first release the locking latches. You will then want to grab the table leg that is stored behind the table and twist it into its position on the table, and then you lower the table down and you have the perfect outdoor eating area. Both the driver’s and the passenger’s chairs will swivel in their place for added seating in the Revel. By simply untwisting the locking mechanism on the ladder, you can then lift the ladder up and move it along both sides and the rear of the coach. 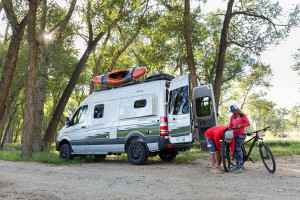 The Winnebago Revel 4×4 was designed specifically for active outdoor enthusiasts, the all new Winnebago Revel takes a no-nonsense approach to adventure with a straightforward design and function-driven features. 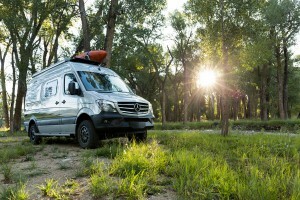 Taking full advantage of the proven 4×4 Mercedes Benz Sprinter chassis, the Revel’s 3.0-L turbo diesel puts 325 lbs. ft of torque through an on-demand 4WD system, complete with high and low range and hill descent mode for added off-road capability. WATCH OUR VIDEO ON WINNEBAGO REVEL DE-WINTERIZATION HERE. Flush as much water through the system as possible using the city fill. Go to each faucet or appliance that feeds water and bleed each until the water is clear. Fill your fresh water tank and turn the water pump on. Again, go to each faucet or appliance that feeds water and bleed each until the water is clear.